A new release of Easy Screen Capture And Annotation is available for download. A major update in this version includes the free image hosing and upload to PhotoBucket. This new feature lets you upload your captures instantly on the web and send the link to anyone using your messaging software or email. 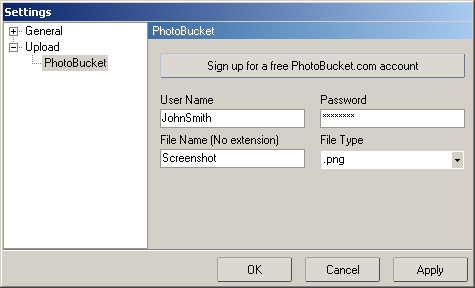 The application provides also a button in the settings panel for signing up for a free PhotoBucket.com account. The setup process takes only few minutes. This new version also improves the rendering engine and provides smooth aliased callouts and text balloons. Some minor issues are also fixed and a tool button that gives you a quick access to the recently opened files list is added. We would like to thank all our users for their support and feedback. Please keep sending us your feedback and suggestions. We will be glad to implement and add them to the upcoming versions. This entry was posted in Easy Screen Capture And Annotation, News and tagged Annotate, Capture, Free, Free Image Hosting, Free Photobucket, Hosting, Image, Image Hosting, Photobucket Upload, Screen, Upload, Web on February 23, 2009 by MindGems Support.